At THE BRAND ELEPHANT, our mission is to make exceptional design accessible. Developing and implementing an intriguing and effective brand, whether for a small business or for a personal purpose (such as a wedding), can be a daunting task. We make things simple with custom logo packages that don't just give you a graphic; instead, THE BRAND ELEPHANT delivers a Custom Insta-brand Toolkit to help you launch your brand with confidence and consistency. We specialize in branding, which means even if you don't have a "brand", we can still make that killer business card you have been dreaming about because we take the time to get to know YOU, your goals, and your needs before we ever go to the proverbial drawing board. Beautiful, custom design is our forte, so wedding and event invitations - along with RSVPs, thank you cards. and the like - fall right in our wheelhouse. Contact us today to book your FREE design consultation! 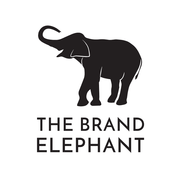 Rate and review THE BRAND ELEPHANT in Wichita, KS, United States! Share your experiences at THE BRAND ELEPHANT with your friends or discover more Graphic Design in Wichita, KS, United States.